Anyone who’s not totally ignorant about the world of EVE around them will know what RvB is (or perhaps was). Anyone who actually paid any attention the community will also know who Mangala Solaris is. From the green to the seasoned, from highsec to null, it is virtually a household name in EVE. People talk about creating content for others, but few ever stuck to it with such dedication and selflessness as Mangala did, from running RvB to serving on the CSM twice and even finding time to write for this very site. Naturally when Mangala left, it felt to me personally like a piece of EVE left with him, and there were many that felt it with me. I wasn’t giving up however. I knew Mang’s love for EVE ran deep. Just like Darth Vader, there was good left in him, I could feel it. So I, and several others, nagged him to come back. Doomchinchilla would be our agent on the ground at EVE Vegas. The mission was simple: bring Mangala back to the family. I’d like to imagine our whining at least played some small part in it, but come back he did! To me, his story is the kind that reinforces my belief in this community, so I asked Mang to write a “cringy feels piece”. Hopefully, someone else out there will recognise what he went through, and be moved by it. Earlier this year, after having played EVE for over eight and half a years, I made the rather abrupt and momentous decision to stop playing this amazing game with immediate effect. In my mind, I was calling it quits at the top of my game – two-time CSM delegate, senior leadership of RvB, chief FC of one of EVE’s largest public roams, and apparently an all round well respected community figure. None of which I ever imagined would be in my future when I started playing EVE back in 2006. As to why I quit, it was not because of game changes like Phoebe, a temper tantrum over multiboxing or a perceived lack of content – the common cries of the vocal when they leave the game – but simply no longer enjoying what I did in game any more. The key reason for this was that I found myself taking on more and more of an administrator role, wrongly assuming that without this being done, all the groups I interacted with would fail to operate, fail to provide fun, engaging content for their members. Every detail of events, roams, and the day-to-day operation of RvB started coming under my scrutiny, yet I failed to see the bigger picture. For years I – and many others like me – had organised all these things while actually undocking, leading fleets and getting into great fights, big and small. In effect I became a manager, not a leader. Once this realisation dawned on me, I decided the only way to fix it would be to walk away from it all. Yes, I could have stayed and simply pulled back from picking at every little detail, but always at the back of my mind would be concern that if I wasn’t doing this, who would? So I did it. I blogged that I had won EVE and called it a day. I did not even give myself time to give away my things, or even biomass my main! However, the sheer amount of kind words that came my way from across the playerbase very nearly pulled me back there and then. Developers, community names, players I considered friends, all wished me well or reflected on the time I had spent playing alongside them. While I did walk away from the game, I admit I continued to pay some attention to the community as I wandered other game worlds and even found time to have a real life. I kept up with sites such as Crossing Zebras, the r/eve subreddit, and through Twitter shared random thoughts with the many contacts I had made in the community. As EVE Vegas got closer, I realised I was both excited – to see friends – and trepidatious, as, after all, attending a large EVE meet as an ex-player would just be weird right? I was wrong. Vegas was one of the things that brought me back to EVE. 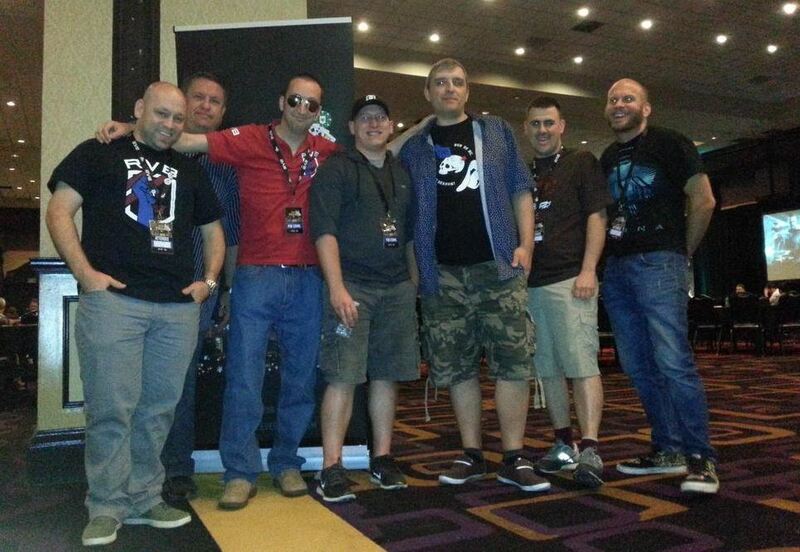 Out of all my Vegas experiences, a few really impressed upon me how great the EVE community is, and why I just HAD to come back. First up was the #broadcast4reps video displayed on the Sunday. To say it touched me right in the feels would be an understatement. It moved me near to tears while demonstrating the true strength of this community when it comes to looking out for one another. The next was the warm welcome I got from friends – old and new, from the devs themselves and from people in general just for being there. For being someone supportive of the community. Then the was the NPSI roundtable, that I somehow had agreed to do quite some time ago. Instead of people walking out, they stayed even when confronted with an ex-player talking at them! (Admittedly the free booze could have helped there.) Interacting with the other panelists and all the folks in attendance was just so much fun. Very reminiscent of a drunk roam in and of itself. Of course, the sheer force of Vegas was not the only reason I came back. The whole RvB situation was a catalyst for my return as well. I felt I had to return to see that the pilots I had worked and flown alongside for years were okay. That they would be able to move past this and find new, exciting homes in EVE. As it turns out the RvB community is as strong as the wider community and may well turn out fine. In the end, I came back mid week. If anyone wants to say HI. I'm chilling in the RvB Ganked channel in game. YES I LOGGED IN. What once would have felt like a surrender, just felt right. Like I was coming home, ready to start a brand new chapter in my own EVE story.